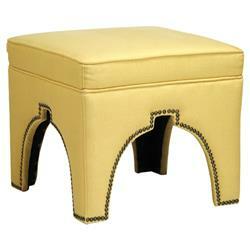 An eclectic, global bazaar inspired ottoman, this brass stool is covered with soft, banana yellow linen. Whether offering small seat in a den or a foot rest in a reading nook, this versatile piece has style to spare. Metallic nail heads line the edges of the Asian-inspired arch beneath the seat.